In Chantal Akerman’s work the element of paradox is everywhere, fractal, supreme. In this she is an artist of her time and place and perhaps most emphatically her gender: Born in Brussels in 1950 to Polish Holocaust survivors, Akerman’s is a life emerged from the death camps. Raised by and among women who appeared to Akerman suffocated in domestic amber, she rallied for her own freedom, deciding as a teenager besotted by Jean-Luc Godard’s Pierrot le fou to make films. In claiming her freedom, Akerman helped to form a narrative tradition where there had been none. For Akerman the highest expression of that freedom was to explore in her art various contexts of female confinement. And the keenest signifier of Akerman’s pervading sense of rootlessness, of unbelonging—a reaction, perhaps, to the threat of confinement of any kind—would also be her truest anchor in the world: her mother, Natalia. At twenty-one, Akerman left Belgium for New York City. There she began collecting the footage that would comprise News From Home—scenes of 1970s New York presented in a series of extended, static takes. The images of lone streets, active subway platforms, and storefront windows bristle with longing. Cool-toned and frank, Akerman’s New York is also a sort of dream of suspended animation, where stillness and movement, presence and absence, expectation and reality hang together in a fruitful ambivalence. The ambivalence is ours for being so powerfully and enigmatically hers: Akerman is implied, as few filmmakers are, in every frame of her films. The more lonely and anonymous the image, in fact, the larger she looms. That there is so little useful distinction between Akerman’s features and her so-called documentaries suggests an artist in search of her own tradition, a separate context beset by questions of separation. Akerman narrates News From Home with actual letters from her mother—ordinary, newsy missives couched in ennui and recrimination. The mother of the letters awaits always her daughter’s too-rare and too-brief replies; she alludes to deadly boredom, her suffering an apparent function of the separation at hand. “Try and write,” one letter implores. “It’s all I have left.” The mother dreams of her daughter, as do other family members. She professes support for the daughter’s adventures but asserts a higher claim with each plaintive word. Akerman’s voice, light and even, is matched and frequently overwhelmed by the sound of New York traffic, New York subways, New York life. Set against the city scenes, the narration soon joins in their rhythm, and from this active, ongoing synthesis derives a sense of lived experience, of consciousness. Subsumed, clarified, and subsumed again, the letters and their murmured claims prevail. News From Home appeared in the wake of Jeanne Dielman, 23, quai du Commerce, 1080 Bruxelles,the 1975 film that established the then-twenty-five-year-old Akerman as one of the era’s major directors. Akerman’s mother, Natalia, saw herself in Jeanne Dielman’s study of a woman bound by domestic ritual, a system within which to manage her larger oppression, and to fend off madness, for a time. On its release, the New York Times called Jeanne Dielman “the first masterpiece of the feminine in the history of the cinema.” The 201-minute film was received as a statement of feminist solidarity, the young Akerman’s determined window on a hidden generation of women, their predicament and its consequences. It can also be viewed as a statement of emancipation: Here is life—a specifically female kind of life—as Akerman herself will never, ever live it. Speaking in I Don’t Belong Anywhere, a documentary profile shot shortly before her 2015 death, Akerman wonders if “throw[ing] Jeanne Dielman in her [mother’s] face was very generous of me,” describing the film as “a kind of mirror that wasn’t necessarily something [women of that generation] appreciated seeing.” In the same documentary, Akerman says it was only with News From Home that she realized her mother formed the center of all of her work. At the time of these interviews, Akerman was completing work on No Home Movie, a meditation on her elderly mother’s decline and impending death. It would be her final film. Akerman’s way with her mother is at once tender and a little brash. She prompts and cajoles Natalia—about the ear doctor, the music, her appetite, the potatoes. Much seems to depend on the latter’s correct preparation and adequate consumption. Both women have made it past the age at which the ruin of a batch of meticulously peeled and boiled potatoes sends Jeanne Dielman reeling toward psychosis. But if advanced age is the only stage of life a parent and child can experience in viable tandem, its collapses and conflations are no less boggling for being shared. Childless herself, Akerman is with her mother by turns maternal and plainly childlike. In Natalia’s apartment roles reverse and converge, both women poised on a brink of departure. Natalia shuffles, as though partnered in a last, gentle dance with her mortality; Akerman comes but always goes, Skyping home sometimes from afar. But it would seem that to truly leave one’s mother requires an understanding of what is being left: The loss of that understanding’s possibility haunts Natalia and her daughter’s every exchange. Akerman’s skin-on, vitamin-intact potatoes—a nurturing, aligning gesture that also rejects, revolts, upends—establish in No Home Movie a paradox of maternal separation that girds all of her best films. Throughout her work, Akerman enacts a formal reckoning with an inexorable problem having to do with time, space, and distance—which is to say a problem of home. In No Home Movie she finally trains her camera directly on Natalia, bringing the full force of her searching, democratic style to bear. Still, the problem persists. As mother and daughter draw out their loving goodbyes on a video chat, Akerman zooms in on Natalia’s screen image until it devolves into a mash of pixels. “I want to show that there is no distance in the world,” Akerman says during another Skype call. “You’re in Brussels and I’m in Oklahoma. Look, there is no more distance.” Back in the Brussels kitchen, both women stand outside the frame, having finished a wide-ranging conversation. “It was so great to have you here,” we hear Natalia say. “I haven’t gone yet,” Akerman replies. Akerman hides from view through most of No Home Movie, a sort of shadow to her mother. At one point the camera seems to capture her remembering its presence and darting out of frame; at another she deftly adjusts her position so as not to obscure Natalia’s shot. Later, Akerman maneuvers the camera into the exact resting position she wants, and we watch an ordinary setting morph into a potent still-life canvas. For minutes at a time the viewer is invited not to watch but to ruminate—on a bourgeois foyer, a backyard’s lone, defunct lawn chair, the branches of a tree beating in an Israeli desert wind. Meaning is subsumed, clarified, and subsumed again, part of a scheme designed to return the viewer to herself, through images that fill before her eyes with a sense of their own extinction. If Akerman appears only in shadows and fragments, the director’s need for her subject carries an almost physical throb. Natalia is so richly anticipated in every patiently wrought, exquisitely framed tableau that her actual arrival within each one is almost beside the point. During one scene, the women tell each other old stories—about a relative’s rumored love affair, the protofeminist in the family, and the pride each of them took in the other’s beauty. In another, the story of their family is an oblique story of the war—the insidious onset of the Holocaust, who saw it coming, who was naïve, who was a communist, who was a Nazi and who was just pro-German. What they don’t discuss, and apparently never did, is Natalia’s time in Auschwitz, where she lost much of her family. Instead, Akerman recounts to a caretaker—who appears somewhat oblivious, smiling oddly—Natalia’s capture by the SS and deportation to the camps. “That’s why my mother is like that,” Akerman says finally. The caretaker nods and smiles. The apartment scenes present a sort of ultimate paradox: Time is running desperately short—and yet, this stillness. Moments linger, the image of an empty living room takes on the character of memory. If the growing void the camera records cannot be closed it need not be definitive: For here is Natalia, talking again; here is time, and a space within which mother and daughter might continue to exist. In Israel, Akerman points a camera out the window of a racing vehicle, capturing the desert terrain as it passes. The sequence, which appears to abandon the director’s usual grounded, static style, begins to assume that style’s effect: a tension between energy and inertia, wildness and control, freedom and confinement, distance gained and time and territory lost. 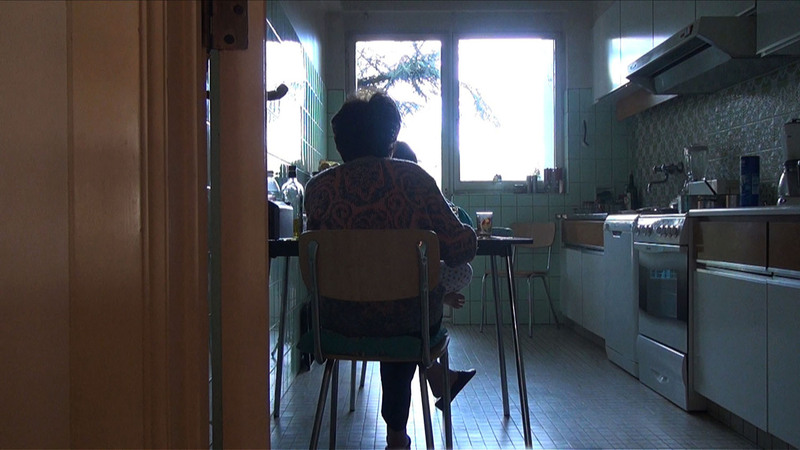 Chantal Akerman seemed wedded to the idea of herself as an artist—a person—without a home. In this she could be said to have attended to her mother’s legacy more truly than her mother ever could. It is Natalia who faced actual homelessness, persecution, and unfathomable loss. Where the mother was trapped in history, and subsequently in the realm of “home,” the daughter was freed by the former and from the latter. Would that it were so simple. At the close of No Home Movie, Akerman returns once more to the Brussels apartment. The image of a distant Israeli town foregrounded by a sea of rippling grass gives way to a shot of Akerman alone in her mother’s modest guest bedroom. No less obscure for appearing in full, she fastens her shoes, stands, pulls a curtain across the window, and leaves the darkened room. In the foyer there is light, cabinets and artwork we’ve come to know. Two urn-like vessels rest on a white inlaid console, also familiar. The frame is layered with doorways, corridors, rooms to enter and to leave. The sound of light traffic and birdsong drifts through unseen windows. A figure looms, and does not appear. Michelle Orange is a contributing editor to VQR and the author of This Is Running for Your Life: Essays (FSG, 2013). Her writing has appeared in Harper’s, the Nation, the New York Times, Bookforum, Film Comment, Slate, and other publications. Her next book, Pure Flame (FSG, 2020), is forthcoming.